While looks aren't everything in a relationship, everyone can appreciate the beauty and attractiveness of their sweetheart. 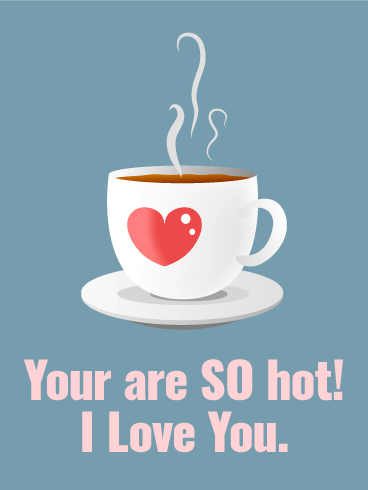 To let your partner know how handsome or gorgeous you think they are, send them this love card! The silly yet sweet message will make them laugh and tell them how lucky you are to be theirs. 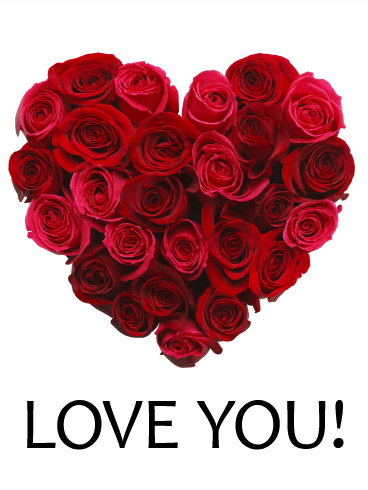 Send this love card to show how great your love is today! 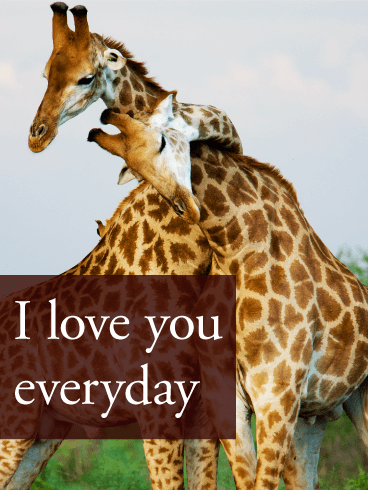 This gorgeous black and white card is a wonderful way to let the person you love know how much they mean to you. 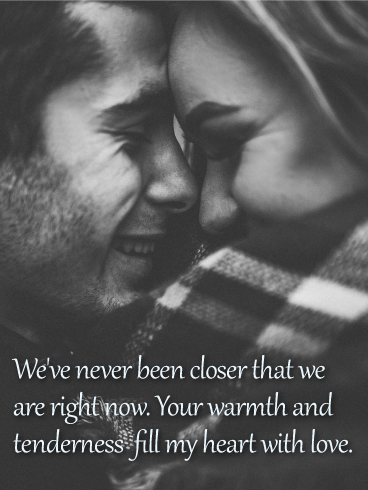 A couple locked in a warm embrace sets a romantic tone, while the touching message below will fill them with happiness, knowing that their "warmth and tenderness" fill your heart with love. The best part is, you don't need a special occasion to send this sentimental greeting! 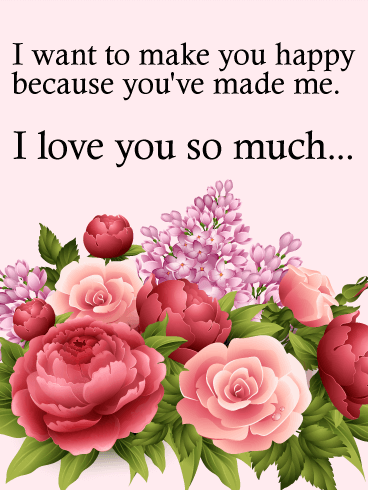 For the one person who knows you better than anyone else, and who has seen every side of you, this is a wonderful way to remind them how much you love being with them! 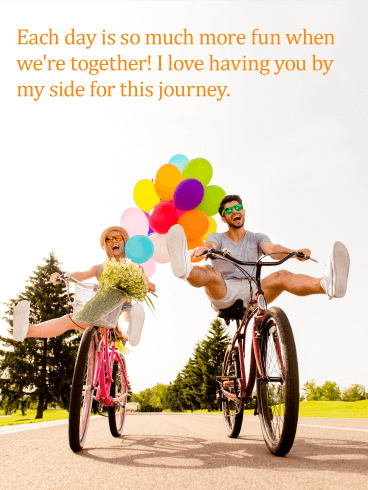 Bright, cheerful and colorful, with a happy couple riding bikes and having fun, it's the perfect out-of-the-blue romantic surprise to send that special someone who you hold close to your heart. A beach at sunset. A swing built for two. What a romantic way to express how you feel to the person who you love having by your side. 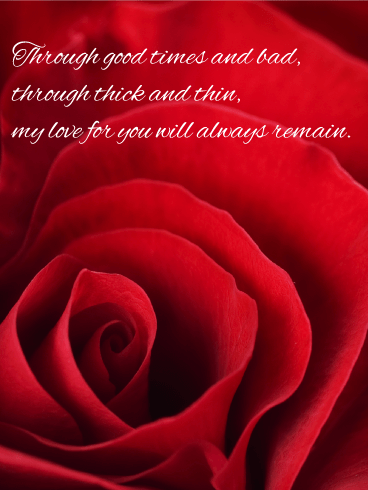 This tender card comes with a beautiful message to the special someone in your life. A reminder that no one makes you feel more secure, and there's no one else you'd rather share your time with. It's the perfect sentiment to send for an anniversary or as an everyday romantic surprise. Two hands form a heart, as light streams in from behind. What a beautiful depiction of the love you share together, which was meant to be celebrated. 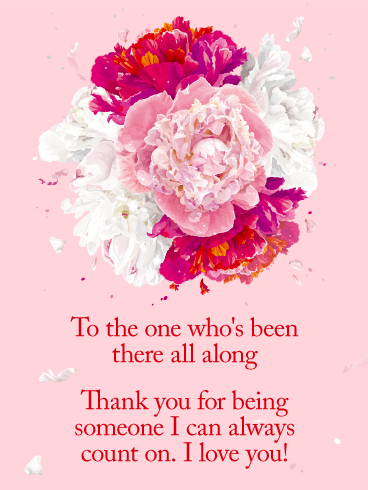 This beautiful love card lets you share how you feel with the one person who completes you in every way. It's the ultimate declaration of love, which can be sent for an important occasion or just to make them smile. There's just something about roses that makes every love card so much better! 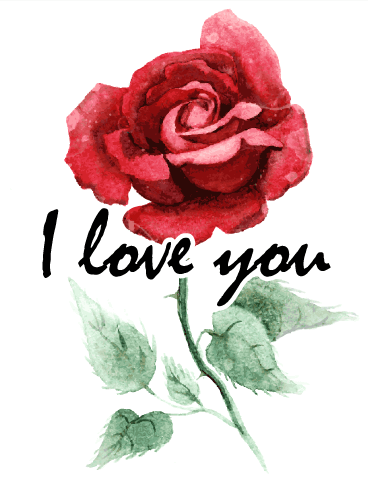 This delicate rose is accompanied by a beautiful sentiment. 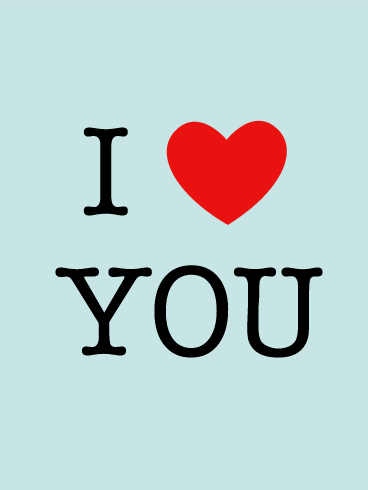 After all, sometimes people just need a reminder that you love them and you'll be there for them no matter what. 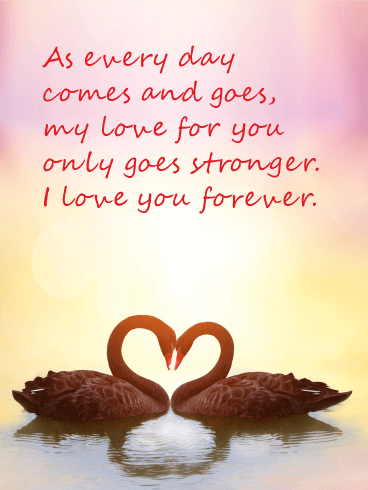 This love card is the perfect choice to convey those feelings. 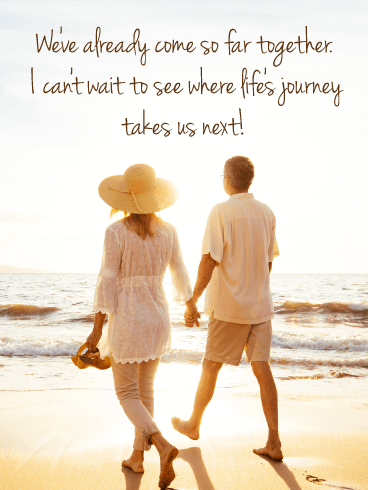 A couple strolling side by side on the beach, leaving footprints in the sand as the waves delicately roll in, paints the perfect picture of love for your own partner in the journey of life. 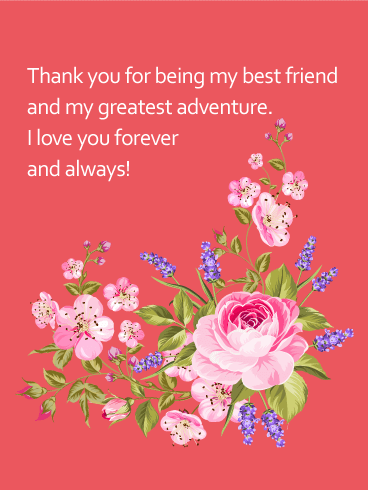 This is a wonderful card to send someone who you've already shared many amazing memories with, and who you can't wait to share even more special times with in the next exciting adventure you take together. A gorgeous blue sky above and a radiant red, heart-shaped tree below give way to a field, filled with rows and rows of flowers. What a romantic way to send your love to the person who has captured your heart from the very beginning. 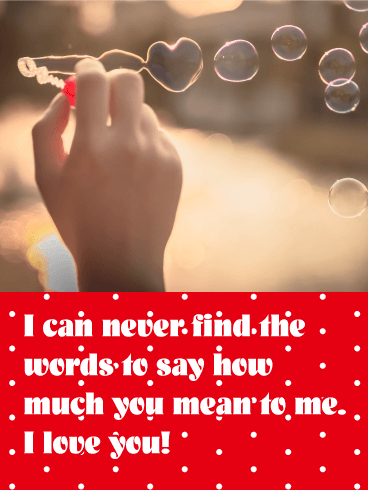 Whether it's a special anniversary, their birthday or just because, this beautiful card holds the most touching sentiment for someone very special. 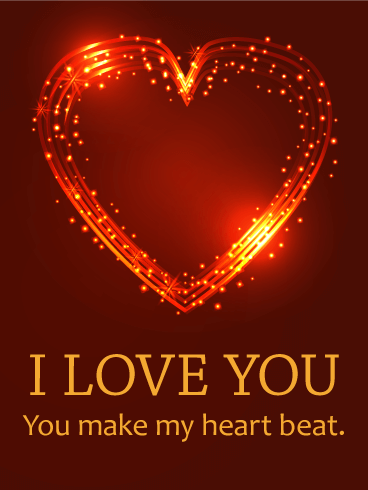 This rich red love card, with a brilliant gold heart made up of lots of smaller hearts, creates a gorgeous backdrop for your touching message below! The expression is one of love. You’re letting the person who completes you know that their presence is enough to make your smile light up and your spirit feel bright. What an uplifting and powerful sentiment to share with someone very special. Sometimes the most important sentiments can be expressed in just a few words. "I love you!" 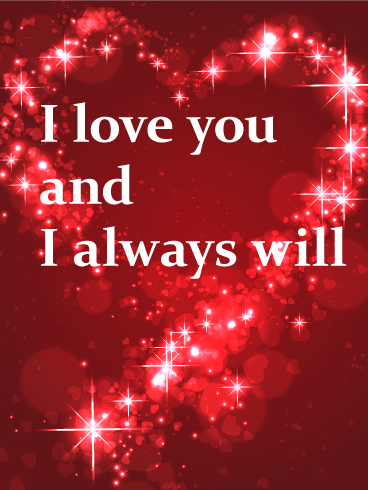 is boldly announced on this romantic love card, which brilliantly lights up the black background so that they'll get the message loud and clear. 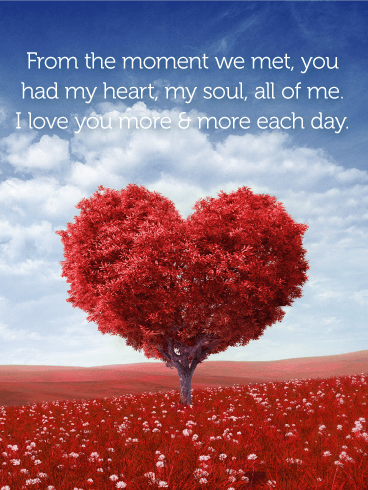 Send this heartfelt love card to celebrate a special day or simply to remind them exactly how you feel! A brilliant pink heart bursts against a dark background, lighting up this beautiful love card while brightening the day of someone you love. It's the ultimate celebration of your love, a grand gesture for even the smallest captured moment together. 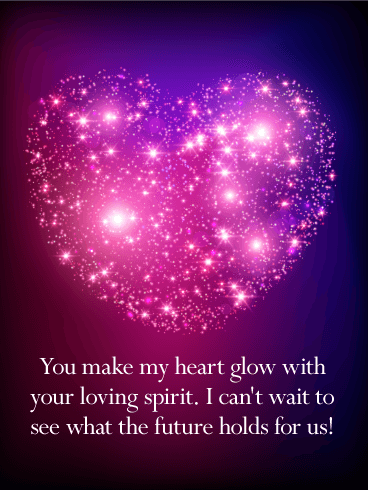 Perfect for a special anniversary or birthday, this touching love card will make them look forward to seeing "what the future holds" with you by their side. Two pure white hearts sit side by side against a radiant red background, setting a romantic tone for the message above. "You've captured my heart and I'm never letting go." What a powerful declaration for the person who is your everything. 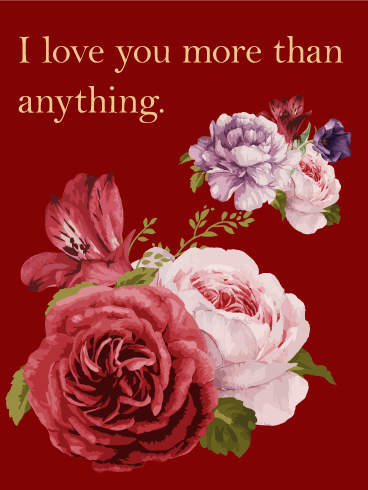 It's such a touching sentiment, which makes this love card a wonderful choice for a special occasion or as an everyday romantic surprise. This picture is pure perfection! From the carefully-selected lighting, to the heart-shaped bubble, it's sure to make anyone smile! The polka dot pattern also adds a quiet element of fun. The sweet words are an added bonus, and they're a perfect way to let the person you love know how you feel. Isn't this love card just captivating?! The word "love" written out in rose petals is sweet enough, but put it on the beach and it's sure to make anyone swoon. 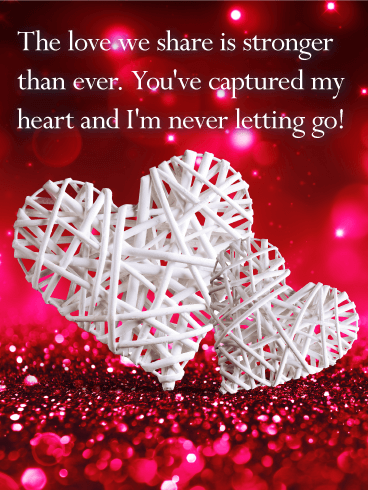 This love card is the perfect balance of simple and elegant, and it’s perfect for that special someone in your life. 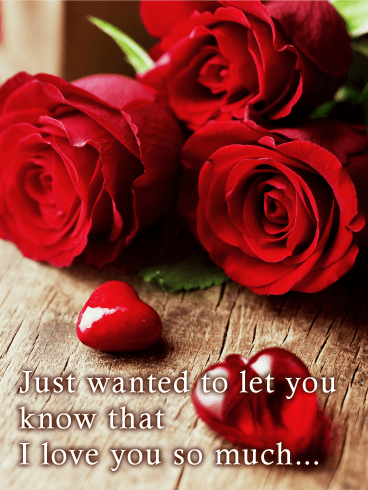 If you've been trying to let someone know how you feel, this love card is the perfect choice! Just look at those beautiful sunset colors... there's just something about sunsets that scream romance. You can't go wrong with this amazing love card- the sentiment, the geese, and the sunset are all a slam-dunk. If you're looking for something that's heartfelt without seeming too serious, this love card is the one for you! The message conveyed about strengthening love is always great to share, and the bright flowers add an element of fun to this card. It's the perfect choice to let someone special know how you feel! Just take a look at this sweet love card! You can never go wrong with flowers on a card, and the bright colors of these flowers and the background add an element of fun. 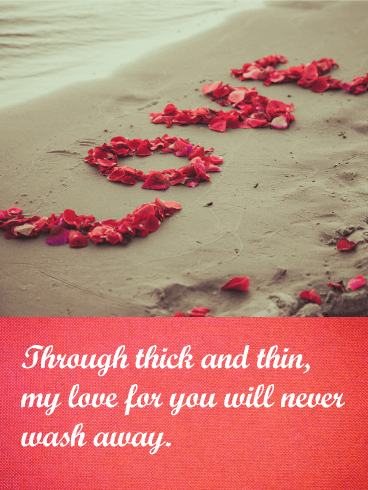 This love card is perfect for any special occasion, anniversary, or just because! The recipient will absolutely love it, with its sweet sentiment and unique design. Don't these sweet puppies just make your heart melt?! 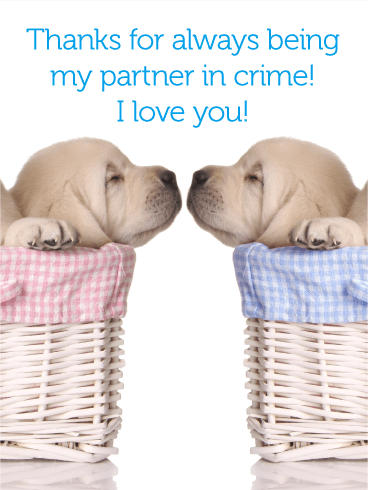 For the dog lover in your life, this love card is a must-have. The puppies are not only adorable, but they're also a great way to show someone how lucky you are to always have them by your side. 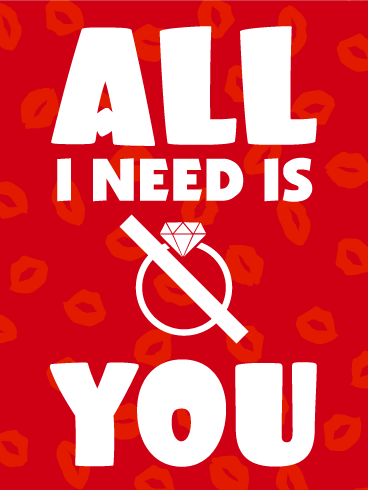 This love card is a can't-miss! 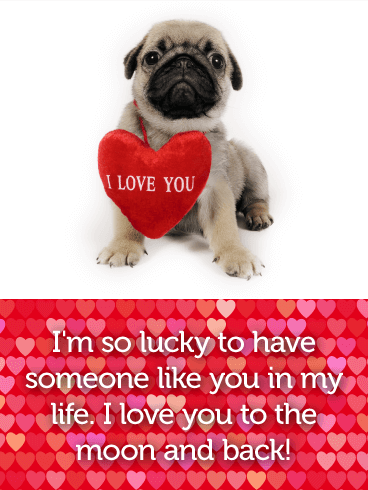 You can never go wrong with a dog on a card, especially when it's an adorable pug! The heart pattern on the bottom half of the love card reinforces the love theme, making this the perfect choice for anyone special in your life. The verbiage on this love card is sweet, and the puppy is just an added bonus! It does not get any clearer than this love card. 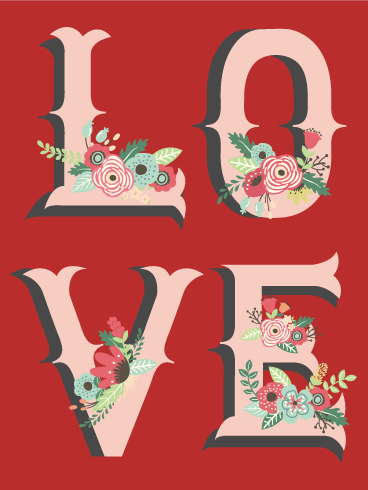 With a vibrant mix of bright red and pink roses fashioned into a heart hanging over the boldly-printed message, your significant other will not have to wonder how you feel about them. They will be feeling the love immediately. So don't leave anything to chance and don't leave this love card unsent. Send your heart straight to theirs. There's a reason we use fiery phrases to describe love. The intensity and passion can feel as unpredictable and unnerving as a wildfire. Those are also dangerous, so get this card, instead. There's a stunning heart that seems to sparkle and flash as if aflame, but it's definitely a lot safer. 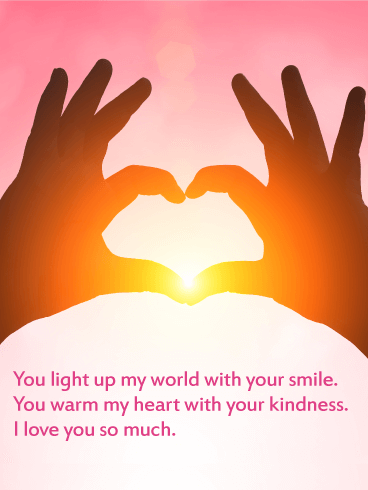 So send this love card to someone who gets your heart beating faster and let them know they light your fire. The world seems so different when you're in love. It's almost as if it glows a bit brighter, like your senses are heightened. The dullness is hidden and everything sparkles. That's the kind of feeling this love card echoes, with its message of eternal love over a glittering heart made up of stars and smaller hearts. 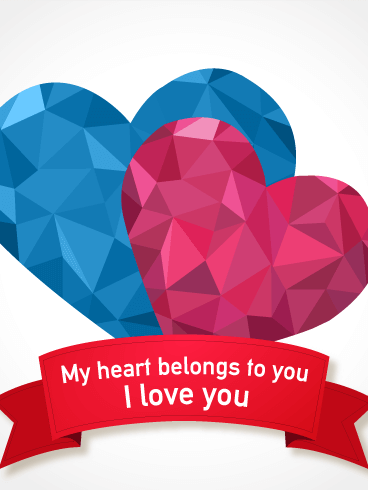 Share that feeling, a reminder of the magic of love by sending this love card today. You can't go wrong with a classic. This love card has all the important ingredients: a bouquet of beautifully illustrated flowers next to a sincere message of enduring love. If you've found your perfect match, there are few better ways to let them know that they light up your life than by just telling them. Take a moment, send this message, and touch their heart today. Maybe words have failed you and you haven't been able to find a way to tell that special someone that you've developed feelings for them. 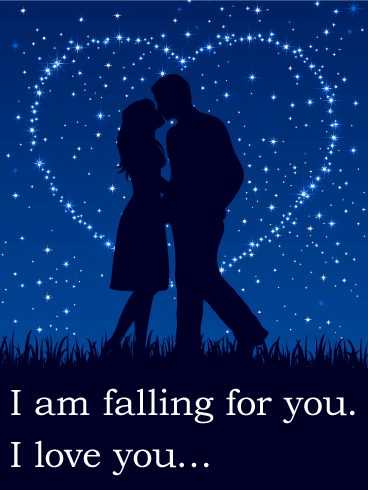 This love card not only has the words, but it also has a gorgeous image of a couple imposed before a sky full of stars. 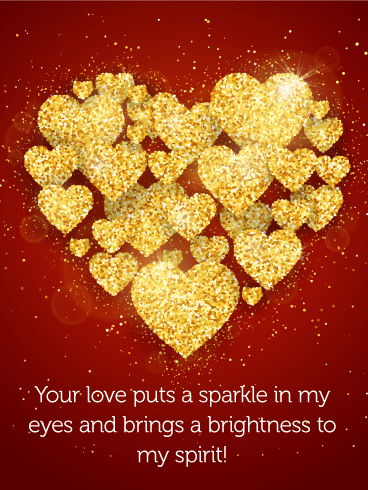 Let the brightest star in your sky know how you feel about them with this love card. Relationships aren't just about the big moments, like fancy dinners and nights out on the town. More often than not, relationships are about the quieter times, when you're just enjoying being together. There's nothing as special as being able to just be yourself with someone who accepts and loves you just as you are. Celebrate those little moments with this love card. If you've ever seen a giraffe up close, you know it's an intimidating experience. All you can do is stand there in wonder that something so big, so magnificent exists on the same planet as you. Love is a lot like that. It's awe-inspiring and larger than life. And if you're lucky enough to have found someone that fills you with wonder, show them how amazing they are with this love card. There are few symbols of love more beautiful than lovebirds. Named for their tendency to form strong bonds with their mates, they love to snuggle and sit closely. If that sounds familiar, this love card is the pick for you. With its lovebirds sitting on a bough underneath branches with heart-shaped leaves and a beautiful message, it's sure to touch the heart of your real life lovebird. Sometimes you don't want a big fuss. You just want to get to the point. That's where a love card like this comes in. It's detailed with some charmingly sweet flowers on a bold red background, but there are no other distractions. It doesn't need any. It's got a simple message, but it's the greatest message we can ever give another person: Love. It's all you need. You know that giddy feeling you get when you first fall in love? Your heart beats faster and you feel almost like you're floating on air. This love card is made for that feeling. It has a cheery pink background reminiscent of champagne bubbles, with a simple but clear message framed with swirling white hearts. Even if you fell in love a long time ago, you can remember those first feelings when you give (or receive) this love card. If you've only got a minute to get your message across, make it count. Be a straight-shooter and don't complicate things. This is the love card for those quick moments. It says so much in so few letters and one big, bold heart. 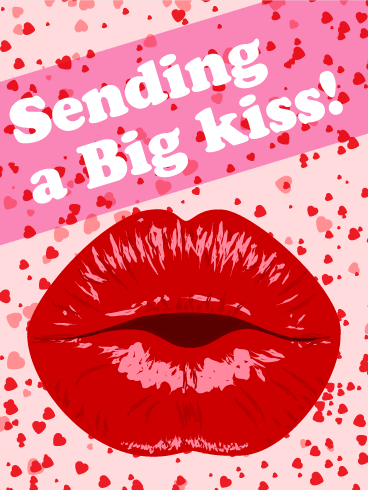 It's perfect to send to that special someone, of course, but it's also appropriate for spreading love to your family or even to your friends. And more love is definitely something the world could use more of. This card is a classic. There is a bouquet of red roses, a traditional symbol of love, juxtaposed with shiny red hearts. Just the image alone would be enough to get your point across, but just in case, there's a tender message accompanying the lovely picture. It's a grand way to let that special someone know that you're thinking of them always. Even if you've been in a relationship for some time, it's still worthwhile to let your significant other know that you still feel the same way about them. In fact, it's important to take time out of your busy life to let them know that they're the most important. 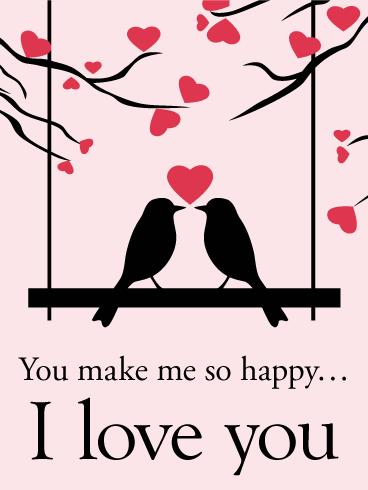 If you've found someone who makes you happy, start returning the favor with this love card. 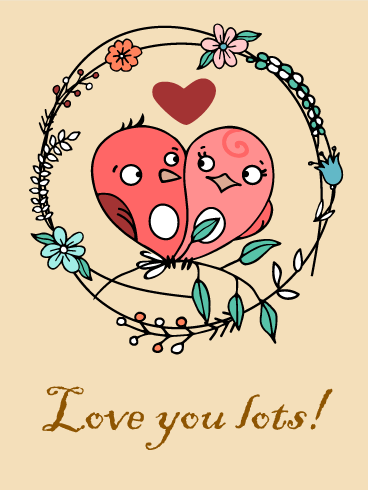 The two snuggling birds on this card represent a happy couple. 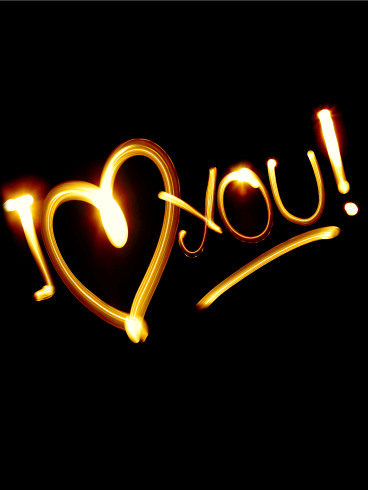 Sometimes it is not easy to tell a loved one how much you care and love. 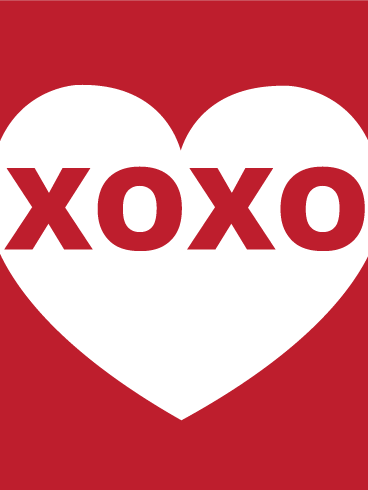 Why not send a love card to express your love? Your loved one will surely appreciate you saying so. Does your heart belong to someone? 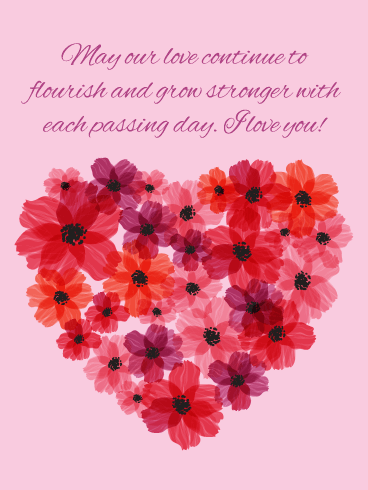 Send this love card in appreciation of the love between you and that special person. Finding someone you love from the bottom your heart is a special and wonderful. 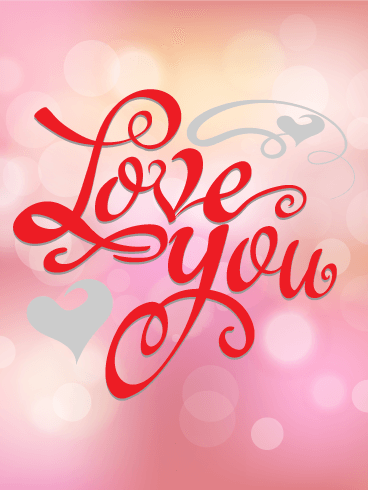 Draw your partner closer by sending a love card to say "I love you". Let us deliver your feelings of love to the owner of your heart. Sending this simple and straightforward love card is great. 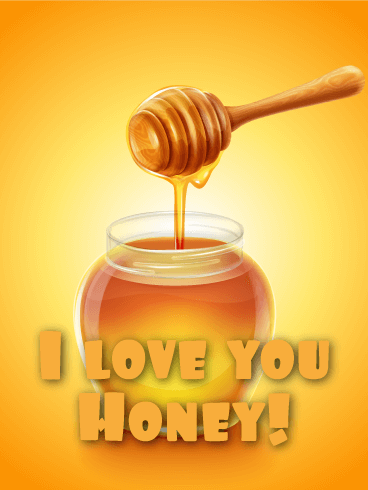 Send this card to anybody you like casually say "I love you".